The R101 combines the functions of a bowl cutter and vegetable preparation machine in one convenient unit. Thanks to its small footprint, this processor is perfect for restaurants, caterers, and schools with limited kitchen space. 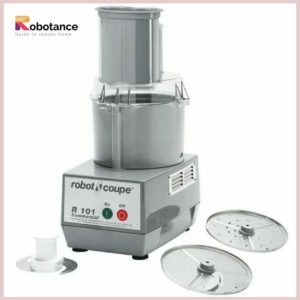 The Robot Coupe R101 vegetable prep machine and vertical cutter mixer duly include the working capabilities of two equipment in one, which remarkably makes it two-in-one. The complete set includes the number of accessories, which are blade cuts, chops, blends, and purées quickly and consistently. Grating and slicing can be done with the included discs and it can be used for softening products too. A bowl which is spacious enough and 2 deep feed openings make a space for a number of different ingredients. Give your vegetables a perfect section for cutting and slicing with the Robot Coupe R101. This combination unit features a 3/4 horsepower motor for outstanding power, and its bowl is both durable and lightweight. The blade is made of stainless steel for a long product life, and a grating disc and slicing disc are both included for extra performance and ease of functioning. There is one kidney-shaped and cylindrical vegetable prep attachment lid makes it easy to feed and process vegetables, last but not the least its space optimum utilization. Standard Model: Includes motor base unit, 2.5 Qt. grey cutter bowl with stainless steel “S” blade, see-thru lid with two deep feed openings, one 5/32” (4mm) slicing disc, and one 5/64” (2mm) medium grating disc. Switching: Clearly depicting the panel with crisp push on/off buttons. Weight: 21 lbs. net, 25 lbs. approximate shipping weight. Mechanical safety system and motor brake. Direct Drive, fan-cooled, 3/4 HP motor. 5 Qt. gray cutter bowl with see-thru lid. The lid has two deep feed openings. Attachments easily removed for superior cleaning and hassle-free. Unit base uses minimal counter space. and a smooth stainless steel “S” blade that’s ideal for the fine or coarse mincing of ingredients as well as making sauces and emulsifying foods. Coarse and fine serrated blades can also be purchased separately and used with the R101. The clear lid allows you to see everything inside ensuring you don’t over- or under mix. The R101 is compatible with a large range of 23 stainless steel discs. You’ll be able to slice, dice, ripple cut, grate, and shred all types of fruits and vegetables. This unit comes equipped with a 2 mm grating and 4 mm slicing disc so you can begin using it right away. The prep attachment lid gives you the versatility of efficiently slicing up any sized fruit or vegetable. The large kidney-shaped hopper is meant for bulkier items like cabbage and celery. While the smaller cylindrical hopper is the perfect size for cutting up narrow or delicate vegetables like carrots, cucumbers, and mushrooms. The patented blade gives perfect results for any quantity whether it’s small or large. The complete collection of stainless steel discs is readily available which fits it all requirements and makes the preparation of various items a lot easier. A 3/4 HP induction motor powers the R101 allowing it to produce up to 15 meals per service. This processor is also extremely simple to use with only two buttons used to turn the machine on and off.
. The R101 Plus combines the functions of a bowl cutter and vegetable preparation machine in one convenient unit. Thanks to its small footprint, this processor is perfect for restaurants, caterers, and schools with limited kitchen space. are suitable for kneading doughs, making hummus, peanut butter and even brittles! The dough blade also helps in dough making and the other blades offer various functions that make it one of the best food processors, which are worth every penny! This is quite an attractive looking machine, and sounds like it’d be quite useful. It looks like great gastronomy equipment. I got my processor for the express reason for making flame broiled cheddar with spinach and pancetta! It is magnificent and cordiality of Giada! Presently off to look at a portion of these different formulas. Those no-heat lime bars are calling my name.